“Is that a weed?” This question, asked by anyone who has ever gardened or mowed a lawn, does not have an easy answer. After all, a weed, as suburban mother and professional weed scientist Nancy Gift reminds readers, is simply a plant out of place. In A Weed by Any Other Name, Gift offers a personal, unapologetic defense of clovers, dandelions, plantains, and more, chronicling her experience with these “enemy” plants season by season. Rather than falling prey to pressures to achieve the perfect lawn and garden, Gift elucidates the many reasons to embrace an unconventional, weedy yard. She celebrates the spots of wildness that crop up in various corners of suburbia, redeeming many a plant’s reputation by expounding on its positive qualities. She includes recipes for dandelion wine and garlic mustard pesto as well as sketches that show the natural beauty of flowers such as the morning glory, classified by the USDA as an invasive and noxious weed. Although she is an advocate of weeds, Gift admits that some plants do require eradication-she happily digs out multiflora rose and resorts to chemical warfare on poison ivy. But she also demonstrates that weeds often carry a message for us about the land and our treatment of it, if we are willing to listen. "Whenever she speaks publicly about loving lawns that have a healthy population of weeds, she feels as if she is giving some people permission to do what they already are doing. "A lot of people will come up and say, 'I've had a lawn like that for a while,' but it's like they feel guilty about it," Gift said. "It's like they had the ethic but didn't really have the chops to say, 'This is what I want to do.'" 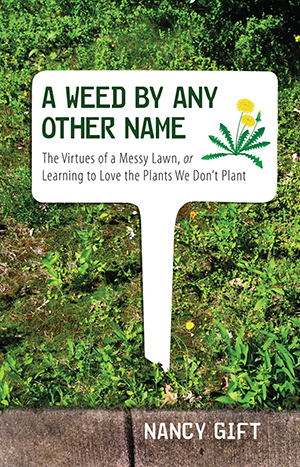 "[S]he addresses other mindful yard owners who want to be more careful in their gardening without making a complete lifestyle change, and this book should appeal to those readers. Recommended."